Why Have I Declared War on the Credit Card Industry? It declared war on me, and my wife (which in turn means my family), and my former next door neighbor, and my colleague down the hall, and probably you. Now it’s our turn. As you will note, the aforementioned letter was written in response to an outrageous change in terms notice that I received in early December, 2008 (here is a link to a copy of that notice; however, I have altered the original by adding yellow highlighter marks for emphasis). Since the letter above mentions correspondence from October 2006 (stating that my 3.99% fixed rate would remain in effective if I met certain conditions, which I have met), here is a link to that letter, from Chase Executive Offices, to me. Here is a link to the original promotional offer; I’ve met my obligations, and Chase needs to recognize that I’m not backing off. The actions by Chase described in my letter will most certainly put me, my family, and thousands of others in harm’s way financially as of January 2009. 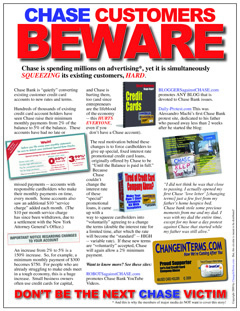 If you want the whole Chase “package,” it includes all subsequent correspondence and just about everything you might need to really grasp what’s going on: the letters back and forth, the change in terms notice, the original 3.99% promotional offer — I think if you’ll read through this, you’ll get the picture. Obviously, there is no limit to credit card companies’ lack of decency or willingness to treat customers with respect (of course, the “business model” that the aforementioned representative used to defend the company’s actions is really based on a complete willingness to exploit anyone, and everyone who might be fleeced for another dollar — or much more with a sky-high interest rate, fees, and other dirty trick that they can think of). Well guess what, credit card companies?